How can I detect any text changes in a textField? The delegate method shouldChangeCharactersInRange works for something, but it did not fulfill my need exactly. Since until it returns YES, the textField texts are not available to other observer methods. e.g. in my code calculateAndUpdateTextFields did not get the updated text, the user has typed. Is their any way to get something like textChanged Java event handler. 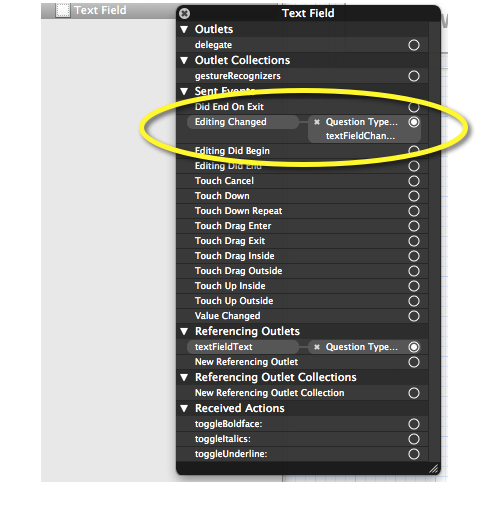 // Add a "textFieldDidChange" notification method to the text field control. Then in the textFieldDidChange method you can examine the contents of the textField, and reload your table view as needed. You could use that and put calculateAndUpdateTextFields as your selector. XenElement's answer is spot on. 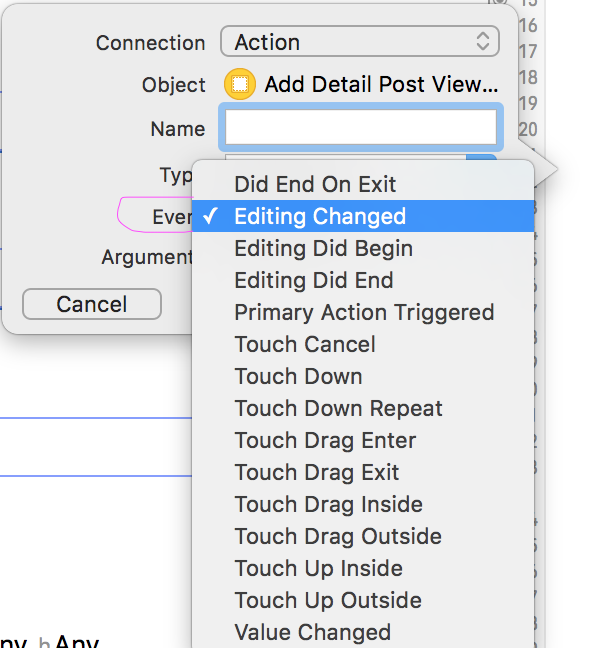 The above can be done in interface builder too by right-clicking on the UITextField and dragging the "Editing Changed" send event to your subclass unit. As stated here: UITextField text change event, it seems that as of iOS 6 (iOS 6.0 and 6.1 checked) it is not possible to fully detect changes in UITextField objects just by observing the UITextFieldTextDidChangeNotification. It seems that only those changes made directly by the built-in iOS keyboard are tracked now. This means that if you change your UITextField object just by invoking something like this: myUITextField.text = @"any_text", you won't be notified about any changes at all. I don't know if this is a bug or it is intended. Seems like a bug since I haven't found any reasonable explanation in documentation. This is also stated here: UITextField text change event. This way you are 100% confident that you'll receive the same notification when you change the .text property of your UITextField object, either when you update it "manually" in your code or through the built-in iOS keyboard. It is important to consider that, since this is not a documented behavior, this approach may lead to 2 notifications received for the same change in your UITextField object. Depending on your needs (what you actually do when your UITextField.text changes) this could be an inconvenience for you. A slightly different approach would be to post a custom notification (this is, with a custom name other than UITextFieldTextDidChangeNotification) if you actually need to know whether the notification was yours or "iOS-made". This involves the Key-Value Observing (KVO) feature of Objective-C (http://developer.apple.com/library/ios/#documentation/cocoa/conceptual/KeyValueObserving/KeyValueObserving.html#//apple_ref/doc/uid/10000177-BCICJDHA). Basically, you register yourself as an observer of a property and if this property changes you get notified about it. The "principle" is quite similar to how NSNotificationCenter works, being the main advantage that this approach works automatically also as of iOS 6 (without any special tweak like having to manually post notifications). Note: Seems like while you are in the process of editing a UITextField with the built-in iOS keyboard, the "text" property of the text field is not updated with every new letter typed/removed. Instead, the text field object gets updated "as a whole" after you resign the first responder status of the text field. Here in swift version for same. I resolved the issue changing the behavior of shouldChangeChractersInRange. If you return NO the changes won't be applied by iOS internally, instead you have the opportunity to change it manually and perform any actions after the changes. //Gets called everytime the text changes in the textfield. // Now do whatever you want. @IBOutlet weak var aTextField: UITextField! Don't forget to set the delegate. It's really simple with observer and reactive swift (RxCocoa & RxSwift). Using Key-Value Observing Notify objects about changes to the properties of other objects. Not the answer you're looking for? Browse other questions tagged ios objective-c swift event-handling uitextfielddelegate or ask your own question. how to use kvo to observer textfiled's text change? How to detect Keyboard key pressed in iphone? Does Key Value Observing Work on UITextView's Text Property? What's wrong with this observeValueForKeyPath:ofObject:change:context: implementation? (iOS) How do I get notified when the keyboard's back button is pressed?